The Look In continues to be a thorn in the side of the Borough Council, After the protest it appears that their has been some new developments. This was sent after a recent radio Berkshire interview that Dale Birch (Borough Council leader) stated on Meridian news that the Look In Cafe could be saved as the 'community cafe' and used as a Youth Centre as well as a Cafe. 'This is a cover up! BFVA were sounding out various groups (like the Alzheimer's group) asking if they were interested in running a joint venture last year - before anything was announced. I believe the council hoped to do the swap over without anyone noticing and were it not for Clare and Bill Heffill they might well have succeeded. This is NOT what the people who marched, and signed the petition wanted. 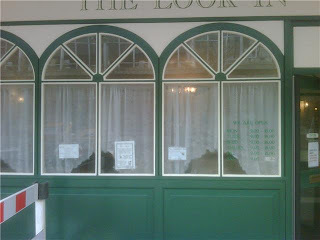 We hoped to keep the Look In as it is now, with the same staff, but with measures to save money, and to put in ideas to make it a self funding cafe. Plenty of people were willing and able to help with ideas and practical help. The centre is not geared for a youth group, this raises lots of questions. They will need some equipment for young people - pool tables, juke box etc. Is there room for this as well as a 'Community Cafe'? and who will clean up after the youth club? We have not been given any idea that this will be for over 50s during the day either. The current clientele surely deserve more respect than this? I feel really let down by the way the council has managed to twist this to make themselves look like saviours. When the closure was first announced in December last year I was in the Look In. A reporter from the Bracknell News came to cover the story and the council was told she was coming. A council representative arrived, told the staff the reporter was not allowed in and waited outside to make sure she didn't come in! Many people went and chatted to her outside. WHY did the council make this stupid ruling? Then Meridian News came - this time the council allowed them in but wanted to be there to give an interview. Mr Dale Birch and a lady from the council came. After the interview Mr Birch made a fast exit leaving the lady to keep an eye on things - Meridian had a strict time limit. Then it was the turn of Radio Berkshire. Again, the reporter was not allowed in. WHY not? Again, lots of people went outside to talk - in the freezing cold, and there was quite a queue of people wanting to make their feelings known. Yesterday (Wed 17th Feb) Meridian turned up 'unexpectedly'. The staff were not told until mid morning and even then no time was given. I imagine it had been organised by the council who hoped the place would be quiet, but it rarely is at lunchtime and every table was occupied. Again, Dale Birch arrived for an interview, but would not do it inside the cafe. WHY NOT? Celebrities are often accused of manipulating the media - in my opinion the council has done just that! 2. Ray Earwicker Lib Dem PPC has called for Cllr Thompson to go as he has not fulfilled his role as Pensioners Champion and has not attending the protest March where over 100 people attended. The Lib Dem Press release on this can be found here . I can understand Angela concerns, it does all seem as if this was part of a longer term plan and I am also concerned that using the cafe as a youth centre could also lead to funds from the other youth centres being diverted? Is this all Spin from the council to say they have saved the cafe when it has actually been changed and not saved? What has Cllr Thompson done to help on this matter, I have emailed him to ask what he has done as 'Pensioners Champion' to save the Look In Cafe and what does the 'Community Cafe' actually mean. The coven at the council has to go. Their arrogance is now verging on the ridiculous. shamelessly hold on to office after ripping off the very taxpayers he claims to represent. Local Blog: High Level of Bracknells Empty Shops?